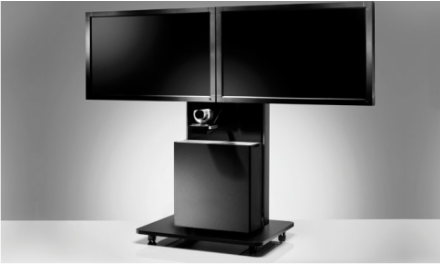 AVALL is a new generation of large screen supports with integrated hardware storage and cable management. It is available in wall-mounted and freestanding versions. AVALL is ideal for video conferencing, exhibition displays, corporate presentations, and display signage. Versatile solid panels can be customized with company logos and graphics. Features such as adjustable camera mount, ability to lock IT hardware, and cooling function ensure ease of use, safety and security. Supports one 65" or two 52" screens in portrait or landscape format up to 220 pounds total.